Q. How do manage an event that I plan to host? Q. How do I keep track of my doctors visits? The Events + Appointments topic enables you to manage all the information related to events you’re attending and hosting (such as meetings or parties); appointments (items that occur as designated times, such as doctor’s appointment); reminders; occasion reminders; iOS/Mac calendar items; and iOS/Mac reminders. For example, from this view, if you’re planning a meeting or party you can create an event, choose the invitees for the event, and email the invitees (directly from the view). 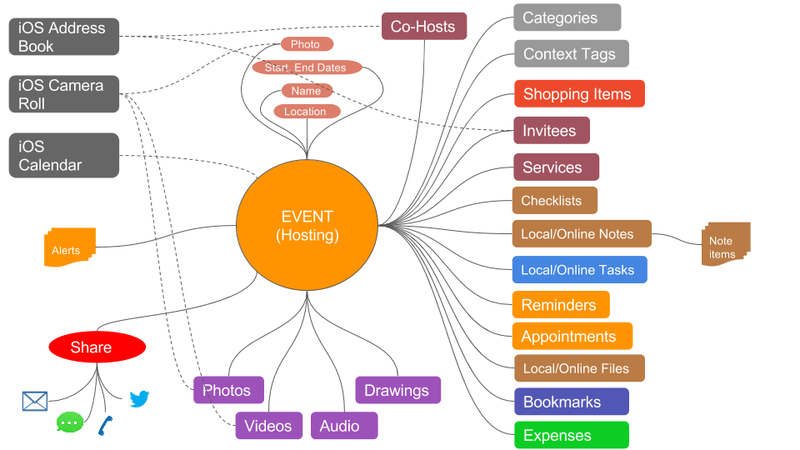 When you organize an event such as a wedding in your LightArrow app, you can organize items such as bookmarks to wedding planning websites; tasks for things to do related to your wedding; locations related to your appointments; service providers, such as bakers, caterers, and flower shops; and travel related items for your honeymoon. In addition, when party planning, you can mark the invitees who plan to attend and the invitees who have declined the invitation. This is especially useful for weddings and other formal events; for example, if you’ve mailed invitations and you need a way to keep track of the invitees who plan to attend, your app can provide you with this ability. An Event in LightArrow apps is a very rich topic object with many data items in it. This following picture gives you an idea of what all a Hosting Event addresses. The Attending Event is also very similar. Attending Event: An attending event is an event that you’re attending, such as a wedding, birthday party, open house, meeting, etc. Unlike appointments, events allow associations with other items, such as tasks, checklists, files, etc. Hosting Event: A hosting event is an event that you’re planning, such as a wedding, birthday party, open house, meeting, etc. Unlike appointments, events allow associations with other items, such as tasks, checklists, files, etc. Appointment: A doctor’s visit, meeting, lunch meeting, or other lightweight scheduled item. Reminder: A one-time item to remind you when something is to occur or a time-sensitive item that you need to be reminded of, such as a reminder to call your grandmother or to pick up your spouse’s dry cleaning. Occasion Reminder: A one-time or yearly item to remind you when something is to occur, such as a festival that you wish to attend. iOS/Mac Calendar Item: Calendar items that are accessed on your iPhone, iPad, iPod touch and Mac. You can view these calendar items directly from this view or on your iOS/Mac calendar. iOS/Mac Reminder: Reminders that are accessed on your iPhone, iPad, iPod touch and Mac. You can view these reminders directly from this view. Custom Notification Set: Allows you to define a set of local notifications that can be added to topic objects like Project, Events, etc. Categories are available for use with Events. You can create, modify, hide, or delete categories via Settings or directly from a tile for an Event. When a category is deleted, it is completely removed from your app. When a category is hidden, it no longer appears in the Categories tile, but it remains defined, and is still available in the category list when you are defining a new Event. Note that categories that are in use or serve as touchpoints to another topic cannot be deleted or hidden. For information about creating categories, refer to your help for Manage Categories. Alerts display at the top of the Events + Appointments view for anything related to events or appointments that are due within the next five days or currently overdue. For example, if you’ve set an appointment to go to lunch with friends, it will appear in the Alerts section when it’s due. Local notifications will also alert you to events, occasions, and appointments (other) depending upon the reminders that you’ve set up in My Settings. The Event Calendar shows a subset of items that you would see on “My Calendar.” It includes Events (Attending and Hosting), Appointments, Reminders, Occasion Reminders, iOS Calendar Items, and iOS Reminders. To learn more about using calendars, refer to My Calendar. Tap the plus sign in the Events + Appointments view. To quickly create an event, type a name that describes the event, select “Attending Event” as the type, a start date and then tap Save. If you want to add more details to the event, tap Full Details. You can modify the start date and add an end date by tapping the Dates tile and selecting the dates. Tap Set. You can select a category, such as “Birthdays,” by tapping the Category tile. If the categories aren’t appropriate for the event you can create a new category by tapping the plus sign. Tap Save when you are finished. If you wish to add context tags, tap the Context Tags tile, select a tag, and tap Set. If you wish to create a new tag, tap New. If you wish to change the iOS/Mac calendar that this event is associated with (the default is selected), then tap Specify iOS/Mac Calendar and choose a calendar. If you wish to add a location for the event, tap the Location tile. To quickly create an event, type a name that describes the event, select “Hosting Event” as the type, a start date and then tap Save. To add co-hosts for the event, tap the Co-Hosts tile, tap the add icon, select one or more person(s), and tap Save. To add invitees for the event, tap the Invitees tile, tap the add icon, select one or more person(s), and tap Save. You can select a category, such as “Birthdays,” by tapping the Category tile. If the categories aren’t appropriate for the event, you can create a new category by tapping the plus sign. Tap Save when you are finished. If you wish to change the iOS calendar that this event is associated with (the default is selected), then tap Specify iOS Calendar and choose a calendar. Open the event by tapping the Events tile and tapping the event. Tap the Co-hosts or Invitees tile and tap the Email icon. Write and send the email (such as an invitation or a communication regarding the meeting or party). Tap the More icon next to name of the invitee. Choose Not responded, Yes, No, or Maybe and add the number of guests. Tap Set. The Invitees view keeps a tally of the number of guests who plan to attend. Note: You can also open the contact(s) and contact them directly (through social media, SMS, or email) from the Invitees or Co-hosts views. You can print individual events, share events via email or discuss events via social media or SMS. Users who receive an event via email can manage it in their LightArrow app. Tap the Events tile in the Events + Appointments topic. Tap the event you wish to print and tap Open. Tap the event you wish to share and tap Open. Tap the event you wish to collaborate about and tap Open. A message displaying, “I’m planning an event (event name). Any recommendations?” appears. When you create events, you can associate a photo icon with the event. Refer to Photos to learn more about adding photo icons to events. To quickly create an appointment, type a name that describes the appointment and a date, and then tap Save. If you want to add more details to the appointment, tap Full Details. To add invitees for the appointment, tap the Invitees tile, tap the add icon, select one or more person(s), and tap Save. To associate a topic with the appointment, tap the Associate Topic tile and select a topic. For example, you can associate a service provider for a company or doctor. To associate a contact with the appointment, tap the Associated Contact tile and select a contact (company or person you are meeting with). If you wish to add the Location, tap the Location tile. If you wish to change the iOS calendar that this appointment is associated with (the default is selected), then tap Specify iOS Calendar and choose a calendar). If you wish make this a recurring appointment, tap Not set to repeat. See Repeat Schedules to learn more. Tap the appointment from the calendar or from the Events + Appointments topic. Tap the Invitees or Associated Contact tiles. For Associated Contacts, tap Show Association. For contacts, tap Call, Email, Text, Message, or Tweet. For invitees, tap the Email icon and select Email All. In the Events + Appointments view, tap the plus sign and select Occasion Reminder. To quickly create an occasion reminder, type a name that describes the reminder and a date and then tap Save. If you want to add more details (such as a recurring reminder) to the reminder, tap Full Details. From the Remind field, choose Once or Every Year. Every Year reminds you for the next five years. In the Events + Appointments view (or through your Quick Add panel), tap the plus sign and select iOS/Mac Reminder. In the New Device Reminder view, select a date and/or date/time to be reminded from the Remind me on field. Choose whether or not the reminder is completed. Choose from your list of iOS/Mac Reminders from the List field. Add any notes or description of the reminder in the Notes field. Learn more about LightArrow app general reminders at Reminders. You can add iOS/Mac calendar events in your LightArrow app that you can manage directly through an external calendar application or iOS/Mac calendar. If you use this feature on iOS, any invitees will automatically receive an invitation via email. In the Events + Appointments view, tap the plus sign and select iOS Calendar item. For iOS the standard Apple Add Event Window appears where you can add details and invitees for the event. For Mac a custom quick add calendar item appears where you can quickly add a title and a date. The Events + Appointments topic helps you to be more productive by allowing you to associate tasks, shopping items, checklists, appointments, reminders, notes, checklists, files, bookmarks, expenses, and media items to events. For example, if you’re planning a wedding, you might set up appointments with your wedding planners and other service providers and you’ll want to be able to easily see all your appointments associated with the wedding in one place. By associating appointments with the wedding event, you have a central location to view these appointments. You can associate an event with a task or a task with an event. Note: Anywhere you find a task in the app, you can open it, tap its Associated Topic tile, and select an event that you want to associate it with. Locate an event by tapping the Events tile in the Events + Appointments topic. You can create a shopping item Shopping + Gifts topic and later associate it with an event in the Events + Appointments topic (or) you can add a shopping item directly in the Events + Appointments topic. For detailed information about shopping items, refer to the Shopping + Gifts help. Creating an appointment is a common function that can be created in many areas of your app. If you wish to add an appointment directly to an event, follow the procedure below. Creating a reminder is a common function that can be created in many areas of your app. If you wish to add a reminder directly to an event, follow the procedure below. You can create a note in the Notes + Files, Lists topic and associate it with an event (or) you can associate a note to an event directly from the Events + Appointments topic. For detailed information about notes, refer to the Notes + Files, Lists help. You can create a checklist in the Notes + Files, Lists topic and associate it with an event in the Events + Appointments topic (or) you can associate a checklist to an event directly from the Notes + Files, List topic. For detailed information about checklists, refer to the Notes + Files, Lists help. You can create a file reference in the Notes + Files, Lists topic to your local and online files and associate it with an event (or) you can associate a file reference to an event directly in the Events + Appointments topic. Files can be local or stored online. For detailed information about creating file references, refer to the Notes + Files, Lists help. You can create a bookmark in the Bookmarks + Lockers topic and associate it with an item in the Events + Appointments topic (or) you can associate a bookmark to a Events + Appointments topic directly from the Events + Appointments topic. For detailed information about creating bookmarks, refer to the Bookmarks + Lockers help. You can create an expense in the Finances topic and associate it with an event (or) you can associate an expense to an event directly from the Events + Appointments topic. For detailed information about expenses, refer to the Finances help. You can create photos, audio, or video within the Media topic (or in some cases directly with your device) and associate them with an item in Events + Appointments (or) you can associate a media item with an event directly from the Events + Appointments topic. For detailed information about creating media items, refer to the Media help.